If you've ever wondered how to pull off a rehearsal dinner fit for a Southern belle, I've got just the event for you! This weekend I coordinated both the rehearsal dinner and wedding reception of an absolutely lovely couple, Mark and Laura-Nelle. They had a Southern BBQ themed rehearsal dinner and a monogram-heavy preppy Southern wedding complete with a biscuit bar! Can't wait to show you both events! First up is the red and white rehearsal dinner complete with sunflowers and mason jars. The mother of the groom, Kathy, had every detail meticulously planned out and it ended up being such a fun celebration to kick off the wedding weekend. The dinner was held at the Charlotte Trolley Museum, which fit the theme perfectly. My favorite part of the event was the mason jar favors. Guests drank their beer, wine or non-alcoholic beverage out of a mason jar. 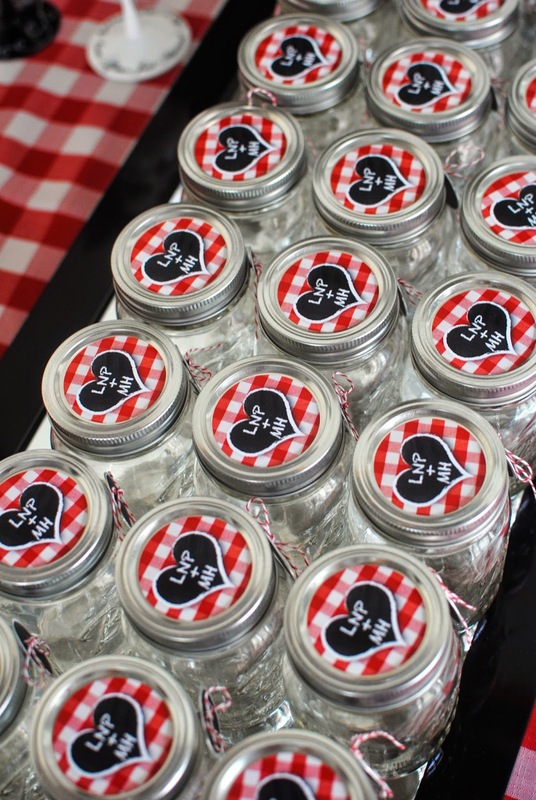 I loved the red and white gingham stickers on top of the mason jars that matched the invitation and tablecloths. Guests wrote their name on the chalkboard tags tied around the mason jars and took a jar home as a party favor. I love this idea and so did the guests! Here's the happy bride and groom with their mason jars! How cute are they?! So. Lets talk food. Because isn't that what makes or breaks a party? The catering was done by Plate Perfect, one of my favorite caterers in Charlotte. They are part of the restaurant group that owns Mama Ricottas, Midwood Smokehouse, Pacos Tacos & Bad Daddys. They always do a great job with presentation, taking extra care with details on the buffet table and food displays. I wrote the menu on a chalkboard with chalkboard markers. When you're writing in chalk, definitely get the markers, it's much easier to write in the marker than regular chalk. And it even made my handwriting not look as terrible as normal! 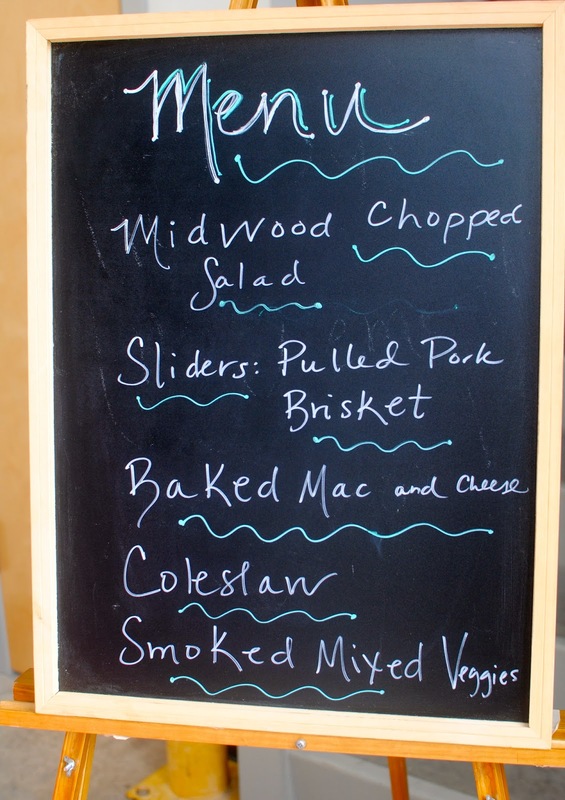 On the menu was BBQ sliders, mac and cheese, veggies and yummy appetizers too - all from Midwood Smokehouse. My favorite app is the Bacon Wrapped Jalapeno which is as good as it sounds - a little spicy if you can take the heat! 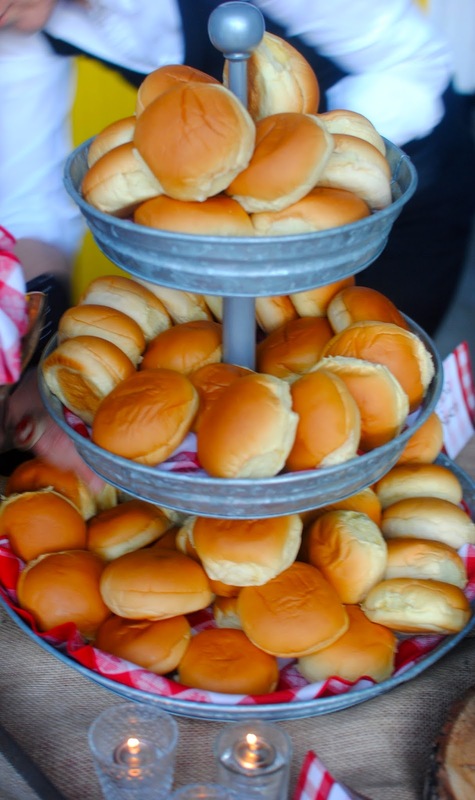 ...and of course BBQ sliders. I loved the galvanized serving pieces Plate Perfect brought, including the candle holders and the 3 tiered tray for the buns. I also loved these pig napkin holders. Silverware was rolled in white linen and tied with burlap ribbon. ...and the salted caramel brownies might just be the best dessert I've eaten in literally forever. 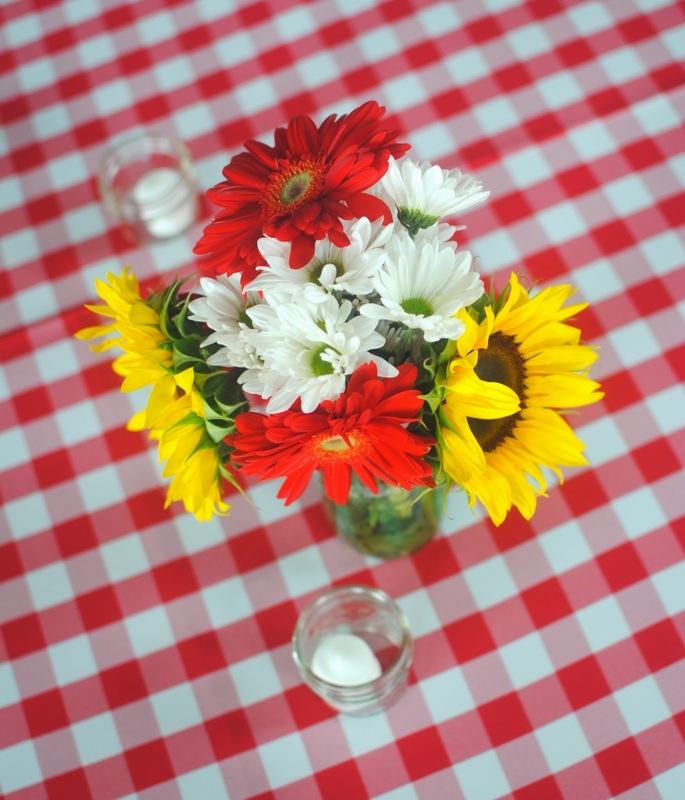 The tables had red and white gingham cloths with mason jar arrangements filled with daisies and sunflowers. ...or a monogram, like the one on this DIY sandwich board created by the bride and groom to direct guests. It was a busy working weekend, but always fun when you work with good people and fun families. Congratulations to Mark and Laura-Nelle and I can't wait to feature their gorgeous wedding reception soon!